HCM CITY — The southern metropolis’ breakneck urbanisation has turned much its surrounding agricultural land into urban space, both officially and unofficially. Residential houses have been built on top of former farmland parcels for decades now, however, existing law has not provided legitimacy for this practice, leading to years-long problems for the residents and headaches for local authorities, the Tuổi Trẻ (Youth) newspaper reported. 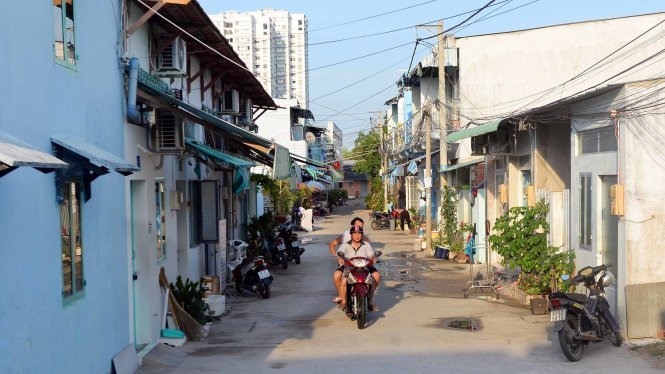 A former two-hectare orchard – located in Alley 148, Nguyễn Bình Street, Phú Xuân Commune of Nhà Bè – is now concreted over and tightly packed with houses, forming an ‘unplanned’ residential area, one that appears not in the government’s official planning, but inevitably out of people’s necessity and today’s trend. The result is a motley of agricultural and residential land. The construction of a number of new houses has been halted midway since construction permits cannot be obtained, due to the type of land they are situated on. V.K., a resident in the Alley 148, said previously, he rented the current 21sq.m house, then after years of saving, decided to buy it for VNĐ350 million (US$15,400). The transaction between him and the then-owner was done solely via a handwritten contract and a photocopy of the land use rights (LURs) certificate - not of said land parcel, but of the whole two hectare. Over time, many other people bought other pieces in the orchard, creating a crowded urban settlement. Some houses with large enough floor area have received approval to be converted to residential land, but other smaller houses, like that of V.K.’s, were not that fortunate. “We bought the agricultural land, knowing it’s risky, but we were cash-strapped and had very few choices,” he said. “Now if the government allows us to get the certificate for the house, good. Otherwise, what are we to do?” he added. L., another resident, said some people living here who want to sell their houses sought a relatively modest price. Though, without proper LURs certificates, it is not an easy sell – interested potential buyers came then looked the other way. Nguyễn Thành Nhung, Chairman of Phú Xuân Commune People’s Committee, said that LURs for houses in this area would be granted when the parcels are splitted and converted to other purposes. However, the division of parcels can only be done when each parcel is at least 120sq.m – much bigger than a typical house floor. The minimum area criterion was set in 2014 to prevent small dilapidated settlements from being built and lumped together into slums without State provision of necessities like water and electricity and other services, which will ultimately hamper the living quality for residents. Nhung also said that some ad hoc ‘unplanned’ settlements have recently been included in city planning, so cases with enough land area can receive LURs and be converted to rural residential land. In the fringes of the city, people have set up their dwellings on former agricultural land for a long time now, notably in other outskirts like Hóc Môn, Bình Chánh, Cần Giờ, or Nhà Bè, but their legal status remains in limbo. However, with the Resolution 01/2017 issued by the government that has just come into effect this March, a window of opportunity has opened for these residents. According to this new piece of legislation, LURs can be granted to houses that have been bought via handwritten contracts prior to January 1, 2008. A resident, N.T.T, living in Vĩnh Lộc A Commune, Bình Chánh District, said if she gets the LURs, she can finally use her current land as collateral to get bank loans and upgrade her ’make-shift’ house, making it more liveable. In the meantime, she will have to wait for commune authorities to issue specific instructions regarding the implementation of the resolution. Trương Tiến Triển, Vice Chairman of Cần Giờ District, said that legally speaking, the state does not allow construction of houses atop agricultural land. Only a few exemptions are made, for example, when a farmer household decides to build a crude shed-like ’house’ for relaxation after working, Triển added. Nguyễn Thanh Toàn, deputy head of HCM City’s Department of Construction, said owners of local houses who build on agricultural land interspersed with residential land that have already been included in city’s planning for residential land can apply normally for LUR. However, people are absolutely banned from erecting houses on agricultural lands that are already reserved in city’s planning for the development of public buildings, schools, or green spaces, according to Toàn. Concerning the purely agricultural land, the city maintains that no purpose conversion, especially for urban development, is going to take place on such areas which are reserved for deployment of ‘new-style rural areas’.